“I have a lot of respect for Lithuanian Poles” – said the leader of the party, that will partially govern the Republic of Lithuania for the next four years. “I am sure that our victory in the elections is a good sign for Poles in Lithuania” – emphasized Ramūnas Karbauskis, one of the richest farmers and businessmen in Lithuania, leader of the Lithuanian Peasant and Greens Union. He won the parliamentary elections, crushing even the largest Lithuanian parties. What does this mean for the inhabitants of the Vilnius region? The names on the list of the winning party and the statements of its representatives in the election campaign leave no illusions – the political views of the Peasants and Greens are radically national (as well as radically leftist!). The leader ensures that the Polish matters will be finally settled once and for all, but… will it turn out well for the Poles? The friendship between Karbauskis and the leader of the Electoral Action of Poles in Lithuania is long, but the coalition is unlikely because of… the controversial political beliefs of Waldemar Tomaszewski. 19 seats and an insignificant defeat at the hands of the right wing in the first round (‘Homeland Union’ with a liberal conservative and Christian democratic ideology won 20 seats) did not indicate such a brilliant success. In the second round Peasants and Greens were peerless: they competed in 40 out of 68 single-mandate districts, where there was a rerun (they won the first round only in 21 districts) and won 35 seats, losing only 5 fights! They smashed even the toughest opponents… with a tractor or maybe with a roller, one can say. They even beat local ‘princes’ and the strongest conservatives in Kaunas – their parental stock and also managed to win with the outgoing Prime Minister Algirdas Butkevičius in his town Vilkaviškis. It was a dramatic failure for the two largest Lithuanian parties: the Social Democratic Party of Lithuania was defeated in the second round 13:2 (the Lithuanian Peasant and Greens Union won with in 13 out of 15 districts, the Social Democrats won in 2) and the conservative party was crushed 19:1! It is a really meaningful vote of no confidence in the ‘traditional’ parties and a sing that it is time to change the government after 25 years of power. The last comparable election success was a success of the conservative party of Vytautas Landsbergis in 1996 after four years of post-communist governance. His grandson Gabrielius intended to repeat this achievement, but he won only in 10 districts (he had his candidates in 42 out of 68)… The idea of using the well-known surname failed. Gabrielius Vytautas (the father’s of Lithuanian national rebirth brother and grandfather were also named like this) had a hard time hiding his rage on the election night. He will have to co-operate with Karbauskis if his grandpa and the President say so. But is the punishment so severe? He was asked about the influences of radical Lithuanian nationalists in his party and related concerns, mainly the concerns of national minorities and the question of the ‘beautiful integration’ of Polish children (a voluntary denationalisation?). As a leader of the winning party, he did not deny his relations with nationalists, but he asked with a disarming sincerity: “Is there really anything to worry about?” As if Lithuanian nationalists were patriots, not chauvinists… He himself may be looking for his own way to solve the problem of non-Lithuanians and he may be regarding the question with an open attitude, but being a politician in Lithuania does not make it any easier. Before the elections he was asked about his attitude towards ‘Poles’ – it is important to explain that while talking about politics in Lithuania the question does not concern Poles as a national minority, but it implies talking about the Polish party – Electoral Action of Poles in Lithuania. At first, Karbauskis tried not to narrow down the notion of ‘Poles’ and take a broader look at the question. He said, with a very open and European attitude, giving hope, especially in Lithuania: “Why are you always asking about the Poles? We have the same problems and a few matters to settle together. Why should we divide Lithuania into different nationalities?” This statement provoked an avalanche of unexpectedly hateful comments towards Poles and towards the politician himself. Later, when the question was clarified, he assured that he is not planning to cooperate with the Polish party. However, in an interview with Wilnoteka, he said that Poles should not be afraid of the Lithuanian Peasant and Greens Union. 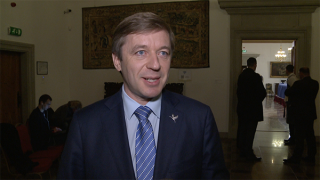 The attempt to clarify the attitude of the Lithuanian government towards the problems of Lithuanian Poles was not optimistic – Karbauskis assured that he is aware of the problems and that a dialogue is required – unfortunately, these words are meaningless. The specific Polish problem, for example, is using Polish letters in documents (mainly “w”, because other Polish letters like “ó”, “ł” or “ś” were not even mentioned). The leader of the Peasant and Greens Party proposed the solution repeated for years by nationalists – Polish version of the personal data on the reverse of the passport, just like in Latvia. It is not sufficient for Polish people living in Lithuania, because of the lack of legal importance. If it was not for the matter of Poles in Lithuania, R. Karbauskis could certainly set up a PiS Lovers Club – even while giving interviews in local media, he does not hide his positive feedback of the Polish government’s policies, both internal and external. It is for him an example of many solutions and even an ideological model – a combination of socialism and national affairs. His first teacher was Jarosław Kaczyński himself: following his example he does not want to have any helpers, no prime minister, he will be the head of his own parliamentary club and he will govern from the rear seat. He would like to go to Poland with the RESET button, like Obama went to Russia. It is a fact that, as one of the few on the Lithuanian political front, Karbauskis can admit with a clear conscience that neither he nor his colleagues promised anything to Poland and Polish people. However, at the beginning of his career he cooperated closely with the post-communist left party, who provided an uncertain foundation of fake promises for the Polish-Lithuanian relations. So again, a dialogue is required between Poland and Lithuania. The Lithuanian Peasant and Greens Union is not well-known in Poland. The name itself incited a lot of comments – being ‘green’ is not problem as it is always related to ecology, but a ‘peasant’? A peasant in 21st century? Brought up on the Union aids? There is a problem with translating the party’s name into Polish. The creators of the party consider Kazys Grinius to be their ‘father’ – one of the founders of the Social Democratic Party of Lithuania, who refused to collaborate with the Germans, when Nazis invaded Lithuania in 1941, because of his opposition to the occupation of Lithuania by any foreign power. The parties that have been reborn after 1990, related to the pre-war ‘peasants-people’ (lit. valstiečių-liaudininkų) ideology, were using the second word for naming their parties – people (lit. liaudininkai), despite the fact that everything that involves the term ‘people’ is strongly marked by a communist stigma. The party had some ups and downs, demergers and mergers during two decades of freedom in Lithuania. This is the reason why R. Karbauskis decided to distance himself from people’s parties using the word ‘peasants’ – Valstiečių Partija – the Peasant’s Party or the Peasant’s Union in order to emphasize that peasants are the backbone of the party and that the cultural and political tradition is still important to them. Karbauskis himself is the son of a leader of a kolkhoz not far from Šiauliai, who was also one of the most important landowners in Lithuania. However, his fascination for Baltic pagan traditions make it impossible to call him a landowner or a baron, like in Poland. He is simply a rich European peasant – a Lithuanian businessmen in 21st century. He remembers that rich Lithuanian peasants, through good education, became the new power of the country. They were ethnically Lithuanian, culturally Polish and Russian, but they did not want to be united with Poland anymore. It is difficult to define the ideology of the Peasant and Greens Union – it is a patchwork of the tradition and the modernity, the socialism and the ecology, the fascination with ethnicity and nature. Liberal leader Remigijus Šimašiu said he does not want to cooperate with the winners of the latest elections. He is the first to say out loud that their ideology resembles national socialism. Others may call it agro-populism. Populism has a strong position in Lithuania and every 4 years a new political experiment emerges (so-called ‘Savior’): social liberalism, The Labour Party, Order and Justice or even National Resurrection Party. And now, thanks to EU funds, the time is right for the peasants to come back.